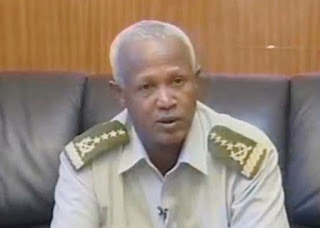 August 19, 2012 — General Samora Yunis, the head of the Ethiopian National Defense Forces, is reported to be seriously ill and receiving medical attention abroad, according to Ethiopian Media Forum, a U.S.-based opposition website. The 57-year-old military chief had been receiving treatment for an undisclosed illness at the Armed Forces General Hospital for several days, prior to his health deteriorating and needing specialized medical care in the Middle East. Amid his absence, reports indicate longtime severing Lieutenant General Tadesse Werede and Lieutenant General Se'aree Mekonen, both hailing from the minority Tigray ethnic group, have filled his position on his behalf. Described as having a “paranoid and secretive leadership style”, by the former U.S. Ambassador to Ethiopia, David Shinn, the ailing general was first appointed to his position by Prime Minister Meles Zenawi in early 2007. During his time as the head of the defense forces, he has orchestrated several attacks against neighboring states of Eritrea and Somalia, while domestically, he has played a key role in quelling and suppressing dissidents against the Meles-led dictatorship.